A should be used before countable nouns that talk about one person or thing. 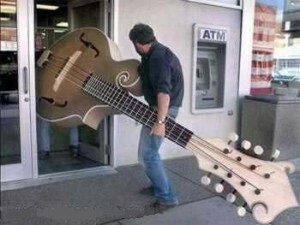 I have a big guitar. • He is a teacher. • There is a man reading a book. Remember: A before countable nouns that talk about one person or thing. Re-write each sentence CAREFULLY using a where necessary. Alberto is reading a book. Book is one thing so a . She bought newspaper on her way to work. She bought a newspaper on her way to work. Newspaper is one thing so a .
I need some paper to write letter on. I need some paper to write a letter on. Here we are thinking of paper as something to write on, and don’t say how much paper we need. So no a . To count paper, we use the word piece. For example, a piece of paper, two pieces of paper, etc. Letter is one thing so a . He gave me box of my favourite chocolates for my birthday. He gave me a box of my favourite chocolates for my birthday. Here we are counting the boxes, not the chocolates. Box is one thing so a . Here we’re are thinking about chocolate as something to eat, not as separate sweets. So, no a . We went for walk in wood after lunch. We went for a walk in a wood after lunch. Here walk is an event not an action. So, it is a noun not a verb. Walk is one thing so a . Here wood is a place similar to a small forest. Wood is one thing so a . Lunch is the name of a meal so no a. The same with breakfast and dinner, no a . He has desk which is made of wood. He has a desk which is made of wood. Desk is one thing so a . Wood is the material used to make the desk, so it is not a thing. There is blonde hair on your shirt! There is a blonde hair on your shirt! Here we can only see one hair, so we can count it. Hair is one thing so a .
I need glass of water. Here we are counting the glasses so a . We can’t count water so no a .